"Materials" on rockclimbingstockpictures shall constitute and be defined as any files, images, photographs available on rockclimbingstockpictures. All Materials downloaded from rockclimbingstockpictures is licensed to you by rockclimbingstockpictures. Downloading these Materials does not transfer any title from these Materials to you, or any intellectual property rights therein to you. You may under no circumstances redistribute or sell this content at any time, and it is illegal to duplicate, download, or distribute any Materials from rockclimbingstockpictures except for your use, which is subject to the Usage Guidelines. The design and layout, as well as all Materials provided on the Site, or of any other website owned, operated, licensed, or controlled by or associated with rockclimbingstockpictures, is protected by the United States and International law and other intellectual property proprietary rights and may not be copied or imitate in whole or in part. EXCEPT AS PROVIDED IN THE END USER LICENSE AGREEMENT, IF ANY, THAT IS ATTACHED TO THE SITE, ROCKCLIMBINGSTOCKPICTURES MAKES NO REPRESENTATION OR WARRANTY WITH RESPECT TO ANY PRODUCT OR THE RELATED DOCUMENTATION AND TO THE EXTENT PERMITTED UNDER APPLICABLE LAW THE SITE IS DELIVERED "AS IS." THE WARRANTY STATED HEREIN IS EXPRESSLY IN LIEU OF ALL OTHER WARRANTIES, EXPRESS OR IMPLIED, INCLUDING BUT NOT LIMITED TO ANY EXPRESS OR IMPLIED WARRANTY OF ACCURACY, CORRECTNESS, RELIABILITY, MERCHANTABILITY, FITNESS FOR A PARTICULAR PURPOSE, AND NON-INFRINGEMENT, AND SUCH WARRANTY CONSTITUTES THE ONLY WARRANTY MADE BY ROCKCLIMBINGSTOCKPICTURES WITH RESPECT TO THE SITE, CONTENT AND MATERIALS. ROCKCLIMBINGSTOCKPICTURES DOES NOT WARRANT THAT THE CONTENT OR FUNCTIONS CONTAINED IN THE SITE WILL BE FREE FROM ERRORS, INTERRUPTIONS, OMISSIONS, DEFECTS, VIRUSES, OR OTHER DAMAGING ELEMENTS, OR THAT ROCKCLIMBINGSTOCKPICTURES WILL CORRECT ANY ERRORS, OMISSIONS OR DEFECTS. YOU ASSUME THE COST OF SERVICE, REPAIRS OR CORRECTIONS TO YOUR HARDWARE, SOFTWARE OR OTHER EQUIPMENT. 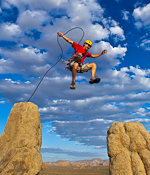 IN NO EVENT WILL ROCKCLIMBINGSTOCKPICTURES OR ANY OF ITS AFFILIATES, OFFICERS, DIRECTORS, EMPLOYEES, LICENSERS, SUPPLIERS OR DISTRIBUTORS BE LIABLE FOR ANY INDIRECT, SPECIAL, INCIDENTAL, ECONOMIC, OR CONSEQUENTIAL DAMAGES ARISING OUT OF THE USE OR INABILITY TO USE THE SITE OR MATERIALS, EVEN IF ROCKCLIMBINGSTOCKPICTURES HAS BEEN ADVISED OF THE POSSIBILITY OF SUCH DAMAGES. IN NO EVENT WILL LIABILITY OF ROCKCLIMBINGSTOCKPICTURES OR ANY OF ITS AFFILIATES, OFFICERS, DIRECTORS, EMPLOYEES, LICENSERS, SUPPLIERS OR DISTRIBUTORS EXCEED THE AMOUNT PAID BY YOU, IF ANY, FOR ACCESSING OR USING THIS SITE, OR PURCHASING OR DOWNLOADING PRODUCTS FROM THIS SITE. BECAUSE SOME JURISDICTIONS DO NOT ALLOW THE EXCLUSION OR LIMITATION OF LIABILITY FOR CONSEQUENTIAL OR INCIDENTAL DAMAGES, THE ABOVE LIMITATION MAY NOT APPLY TO YOU.